The product is a composition of amino acids (beta-alanine, L-arginine and L-citrulline), plant extracts (wasabi, cocoa, ginger, green tea, black pepper and cayenne pepper) and caffeine, additionally supplemented with vitamins and minerals. *Niacin and thiamin contribute to normal energy-yielding metabolism. *NRVs – nutrient reference values. 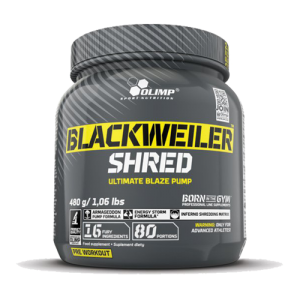 Caution: Blackweiler Shred contains caffeine. Not recommended for children or pregnant women (caffeine content: 100 mg/ 1 portion (6 g), 200 mg/ 2 portions (12 g), 300 mg/ 3 portions (18 g)). The product is not to be used by women who are breastfeeding, pregnant or planning to get pregnant, in case of circulatory system diseases (e.g. hypertension), diabetes or in case of hypersensitivity to any formula ingredient. Do not consume at the same time or on the same day as other products containing caffeine (e.g. other food supplements, coffee, tea, chocolate) or products containing synephrine (food supplements). Do not exceed a daily intake of 400 mg of caffeine from all sources. Do not use before bedtime or during the immediately preceding hours before sleep. Do not use in conjunction with alcohol. Some individuals may experience a sensation of tingling or numbness after the consumption. This is a temporary effect which is attributed to strong effect of beta-alanine. It does not affect health. Use one portion of the product (6 g) to prevent symptoms. In case of the occurrence of severe symptoms, especially malaise, anxiety and palpitations, which can occur when taking portions containing 300 mg caffeine (18 g) the product must be discontinued. Permissible lumping of a product does not affect quality of the product. Keep out of reach of children.